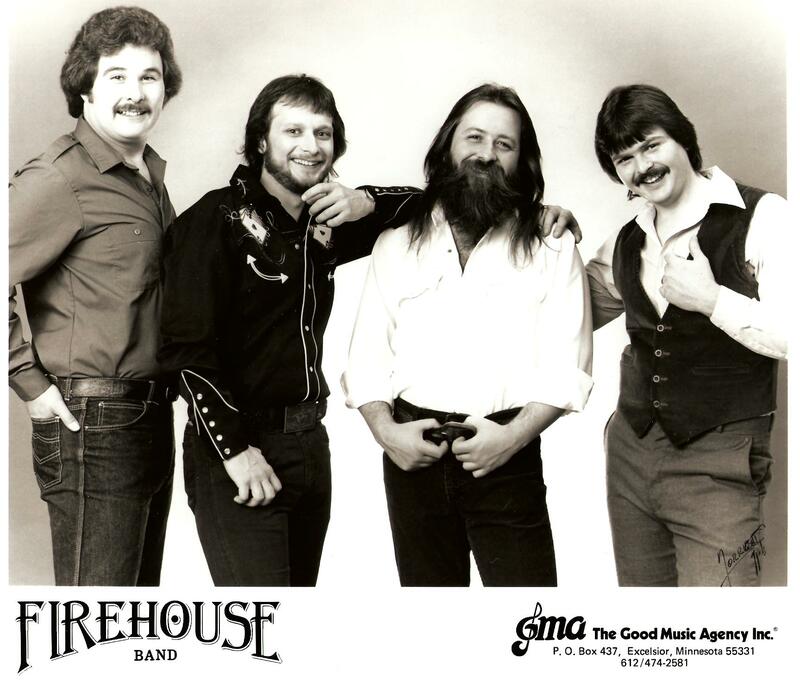 The Firehouse Band seems, in retrospect, an unlikely place for me to be but even in a metro area of 1.5 million people it’s still a small world. At the time Firehouse approached me, they consisted of 2 former Pony Express members, a drummer who I had passed on at an audition for Pony Express, and a rhythm guitar player who I didn’t know. I was looking to re-form Pony Express for the nth time and I was tired. I put an ad in the paper for musicians, and Al Pettis, Firehouse’s bassist, saw the ad and recognized the number and decided to give me a call. After a bit of negotiations and clarification, I decided that Firehouse was a good thing and abandoned Pony Express. The Firehouse Band had a lot going for it. The drummer (Steve Pawlenty, 2nd cousin to The Governor) and Bobby Messerich were great singers. Al is a very talented bass player and does ok with vocals. I used to be able to sing a high C full voice and did well on some songs for lead; so the focus of the band was vocals with a sort of American patriotism theme. We still had plenty of instrumental flexibility with Bobby playing guitars and mandolin, and me doing guitar, keyboards, violin, and harmonica. Bobby’s guitar style was unlike anyone I’ve every worked with before or since. It’s characterized by bursts of amazing speed. Firehouse worked very steadily, sometimes going for months without a night off. Al was determined to book every gig he could, even some that didn’t make financial sense because the time and expense of doing the gig was more than the pay. But Al had a very positive attitude about booking work that transcended pure dollars. First off, we’re a band, and we play. So we should play whenever we have a chance. Secondly, the off nights that most clubs are open (Sunday and Monday in those days) were when club owners, booking agencies, and talent scouts were free and likely to be looking for something to do. So, the second reason was exposure. Here are some Firehouse Band recordings. I have dug up the tapes of the very first album recorded at Euphonic Studio and I am remastering them one at a time. I’ll put a few other songs in there as well. You should be able to tell what’s what by the notes. I have to say something about this recording. Firehouse booked through GMA (Good Music Agency) who made a deal with the Minnesota Twins to rotate their bands through to sing the National Anthem at Twins’ home games. The deal was that you provided the Twins organization with a tape which they played over their legendary Metrodome PA (my gawd it was truly overkill). They provided you with a live mic in the middle of the field to actually sing into in case something went wrong with the tape. Well… Firehouse tended to procrastinate and I was trying to get them into my studio to record this for weeks. As the date drew near and it was obvious that it wasn’t going to happen, Al suggested that I sing the thing myself. So I did. The recording below is what played over the humongous Metrodome PA. None of the band had ever heard it before we walked out to mid-field with our white tuxes on and the tape thankfully started playing. I say thankfully because we hadn’t rehearsed it, either! So there we were, up on the gigantic TV, lip-syncing to me singing the Star Spangled Banner in 4 part harmony with myself. I threw in a bunch of reverb on this mix because that’s what it sounded like. I got to meet Kent Hrbek and Kirby Puckett PLUS I got to “sing” the SSB for a Twins Game. BTW, we beat the Red Sox 4-1. It was the last Minnesota appearance of baseball legend Carl Yastrzemski. Bumble Boogie – On this song you get to hear my Kimball 42″ console in very bad need of tuning. B. Bumble would be proud! This was recorded at the First Annual Volunteer Jam North, which I organized. I spent 3 months of my life on the phone, writing letters (long before email), or visiting people in person, talking people into giving me things or doing things for free. At the end, I ended up throwing a giant concert of most of the Twin Cities top bands, in fact, 18 of them. The event happened in March 1984 at the Medina Ballroom, and the proceeds went to World vision International’s Ethiopian drought relief program. It was an experience I’ll never forget and also never be able to thank all who participated for free to keep the thing going. We had two stages and there was never more than 5 minutes between bands. What a stage crew! Someday I might put up more info on that event, it was a life-changing experience for me. Most importantly, it was a life-changing event for some people in Africa. Next: how a chance employee friendship put us in Peter Drake Studio in Nashville recording 4 songs for Dennis Morgan, one of Nashville’s most successful songwriters for decades. Hey Bill! This is cool but im not able to hear the songs. They dont even start. Could you e-mail me a copy of the poster above? Got the poster out and you have it. OK, I spent some time troubleshooting the problem with Internet Explorer 9 and my .mp3 player software. You have to have Java and/or Flash Player installed AND you have to set your browser to “compatibility view” in the tools menu. It’s not difficult but a better solution would be to find a better player… so I’ll do that. 2014, and you can listen now. Wanna dance? Grab a bucket of water (to put out the ensuing fire) and “dial up” Orange Blossom Special at the bottom. YEE HAW-VA!